It is that time of the year when the grey British landscape suddenly turns into an oriental brush painting; a silk screen of delicate pink and white blossom shimmering against blue skies. It won’t last! 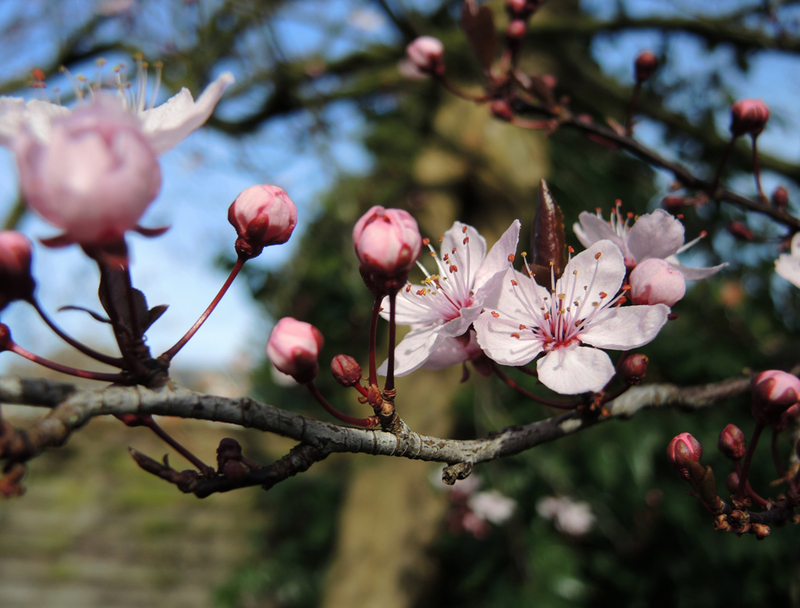 Thursday 20th March 2014 marks the vernal equinox, the first day of spring in the northern hemisphere. During an equinox the Earth’s tilt relative to the sun is zero and the length of day and night is approximately equal. This auspicious event is marked in various ways. For Christians, the date of Easter is set as the first Sunday after a full moon following the vernal equinox. Boatyard workers in Annapolis, Maryland hold a “Burning of the Socks” festival which speaks for itself, feet are not graced by socks until the autumn equinox. It is also marked by World Storytelling Day. As spring represents new life, pagans throughout the centuries have celebrated various gods and goddesses such as the Green Man, Aphrodite and Ostara who represent fertility. Ostara, sometimes known as Eostre, is an Anglo Saxon deity worshipped throughout Scandinavia, the Germanic countries and Britain, as you may have guessed it is where Easter gets its name from and explains the association with eggs. She is alluded to in writings by Bede and Jacob Grimm and now has an asteroid named after her. 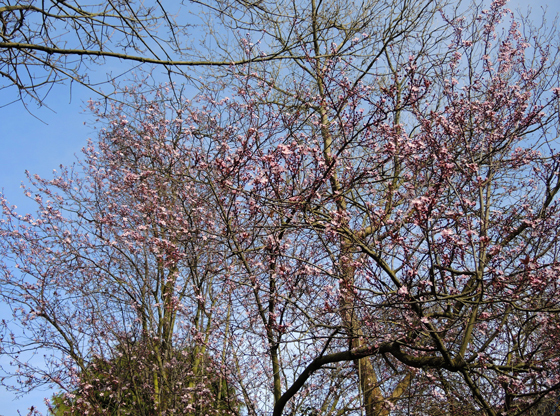 The garden is currently pinkified by the blossoms on two trees. 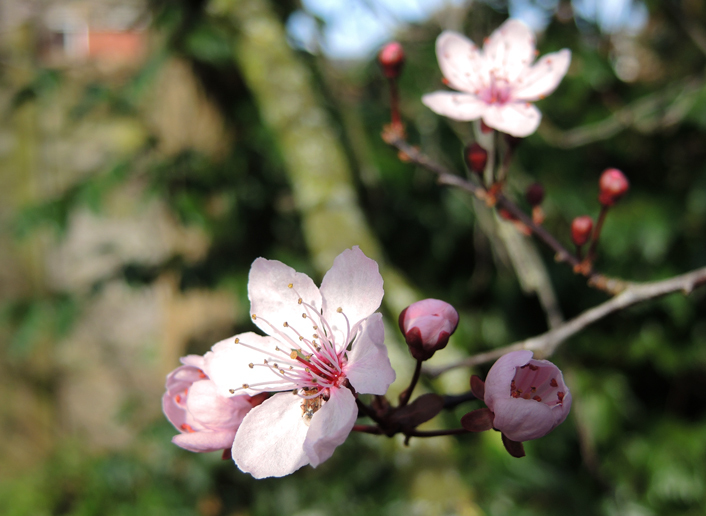 Thanks to the efforts of my friends on Twitter I think they may be prunus cerasifera nigra, from the family rosaceae. 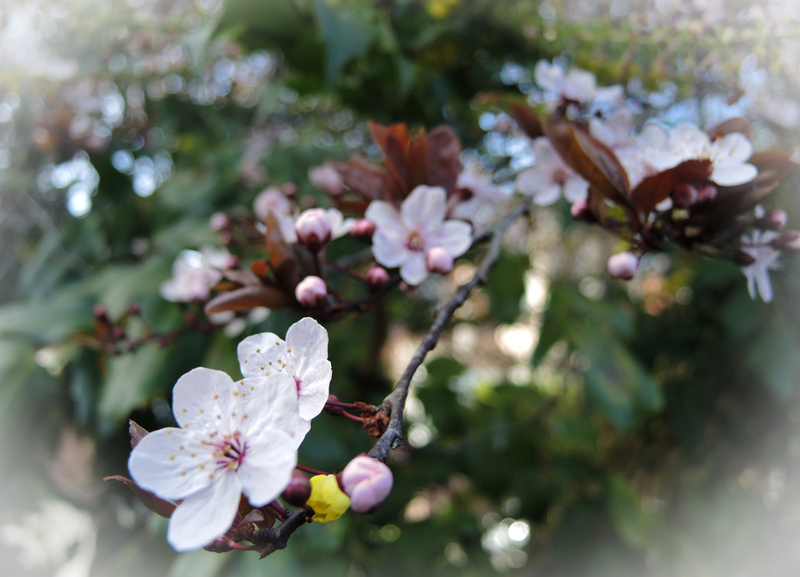 They are also known as black leaved cherry plums. I was a little confused as to what they were as they never produce any fruit. They do however give a splendid display of pink blossoms and have beautiful copper coloured leaves which darken to purple. For the landscape architects out there here is a link to more information. Plums are related to cherries, peaches and almonds; they are thought to be one of the first fruits cultivated by humans. 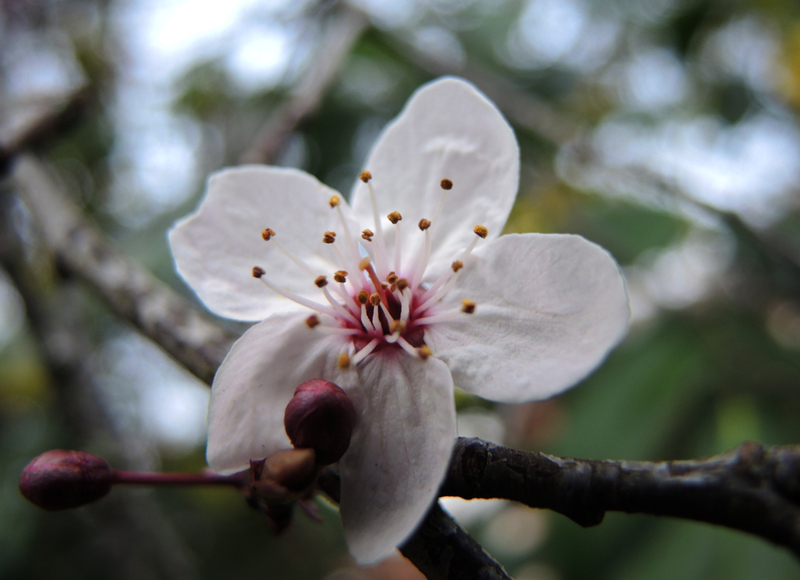 Being one of the first trees to produce blossom it is an important food source for bees and if you have one that produces fruit, then that would make the birds very happy. If you wish to deprive the birds of a feast I have tracked down some recipes for jam; here and here. The colour of the leaves, as with copper beeches, is caused by the presence of large amounts of pigmented anthocyanins which mask the green chlorophyll colour. In 1878 a French gardener with the unlikely name of Monsieur Pissard was impressed by the Shah of Persia’s (Iran) purple plums and introduced them to Europe. This entry was tagged Anthocyanin, Basho, Black Cherry Plum, blossom, Burning of the Socks, Ostara, Pissard, Plum Jam Recipes, Spring, Vernal Equinox. Bookmark the permalink. You have a very neat site. I like your design, pictures and dialogue all mixed in, and the history I do enjoy. Happy Easter to you also my friend. Thank you, that is very kind. I enjoy the little dramas that unfold with your beautiful birds. Well, glad you enjoy the dramas. The little love sick woodpecker still comes by and looks at his reflection once in a while, but he doesn’t fly into it as he did before.